2 Bed, 2 Bath in SunBird Golf Resort, Chandler. 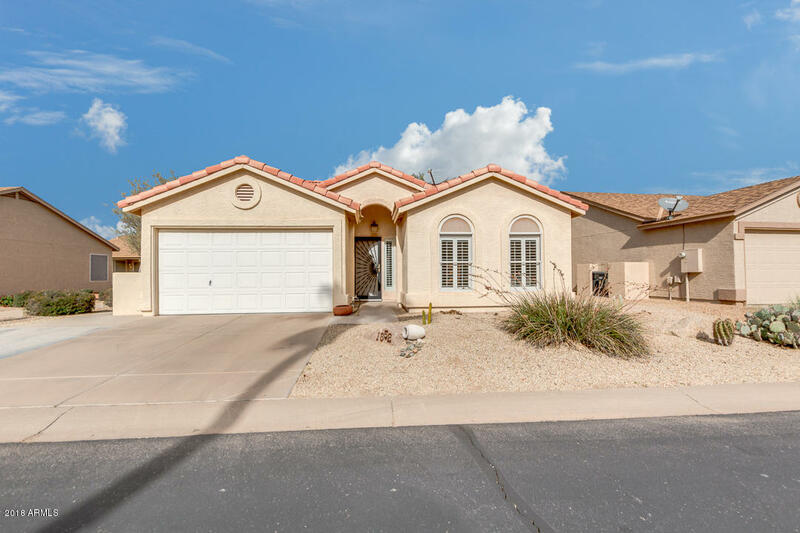 A popular Santa Barbara with Open Floor Plan, Vaulted Ceilings, Large Great Room, Split Bedrooms, Large Master Suite and walk-in Closet. Tile Flooring and Plantation Shutters throughout. Newer SS Dishwasher and Water Softener. Updated Light Fixtures, SS Sink, Tile C-Tops and RO. Widened Driveway for added Parking. Other features: Extended Back Patio, Rain Glass Shower door, Front Security Door, Pull Down Attic Stairs, Laundry cabinets, Garbage/Recycle Enclosure. Amenities: Post Office, Exec. Golf Course, Driving Range, 43,000 sqft Clubhouse, 7,600 sqft Ballroom, Restaurant, Bar, Heated Pool & Spa, Health Club, Tennis, Pickleball & Bocce Ball Courts, Billiards, Library, Lapidary, Ceramic & Craft Rooms, Bike/Walking Paths & Fishing Lakes.